Independents' anger in Massachusetts a sign of things to come? 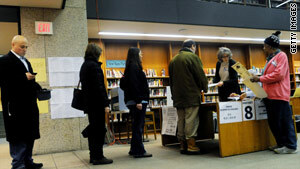 Voters wait in line Tuesday at the Boston Public Library in the special election to fill Massachusetts' U.S. Senate seat. Washington (CNN) -- Political analysts say that emotions played as big a role as issues in Republican Scott Brown's earthshaking win this week in traditionally Democratic Massachusetts. And those emotions will appear likely to influence the rest of the political season into the November midterm elections. "People are so angry out here in the real world they can't see straight," political analyst Jennifer Donahue said. Independent voters can break an election. It happened in 2008 and once again in 2010. A day after his victory to fill Ted Kennedy's old Senate seat, Brown said Wednesday the one thing he heard the most during his campaign was that people were tired of business as usual. "That means the behind-the-scenes deals. ... They want to make sure that their elected officials are doing things in a transparent manner, and doing it with the best interests of our state and mine." While Massachusetts has traditionally voted Democratic, there are more voters registered as independents than Democrats or Republicans combined. And they largely broke for Brown rather than state Attorney General Martha Coakley, the Democratic candidate. Video: Are Democrats rethinking agenda? Donahue said the surge of independents voting for Brown reflects a larger phenomenon happening across the country. "[The election had] a similar dynamic to the electorate and the actual group that elected Obama ... this combination of independent swing voters and Democrats," she added. "What it really shows and what the big implication is for the rest of the 2010 elections are -- the country has moved to the center. Washington has not kept up." Paul Begala, a Democratic strategist and CNN contributor, said he had a similar theory. "People in the middle, particularly, but actually at both fringes as well, they really want change. That's how we got Barack Obama in there," Begala said. The challenge for Democrats is to reconnect with voters and try to make the case that they're not fully responsible for the country's problems, Begala said. "That those deficits that all those independents hate, they were caused by the other guys," he said. "Those were all Republican-Bush deficits that the Democrats are now trying to pay down. And I think they have to make that case. They have not done so. They certainly haven't done so in Massachusetts." Donahue said fear and insecurity are driving voters' anger. "The roar that was heard [Tuesday] night by Scott Brown's supporters is about joblessness," Donahue said. "The roar is about the lack of financial security and lack of a financial picture going forward for most Americans. That is where the anger is coming from." Those emotions got Obama elected, said Republican strategist and CNN contributor Alex Castellanos, adding they're now focused on the president. "Two years ago, the Republican Party was the party of irresponsibility; we set the world on fire and spun ourselves to death," said Castellanos, who advises the Republican National Committee. "We de-branded ourselves. Democrats elected Barack Obama as the opposite of that -- the candidate of responsibility. "Guess what, he has now de-branded the Democratic Party as a party of economic responsibility. He is the guy creating uncertainty out there, and that's a big change. The Democrats have to repair that or suffer the consequences." Anger and frustration fueled the "Tea Party" movement through last summer and fall when the health care overhaul was ramping up in Congress, some political observers say. Ned Ryun, president of American Majority, which offers training for many Tea Party activists, said the movement's followers, much like independents, are frustrated with both parties. "They are sick of it, and it's very much anti-establishment at both parties," he said. "They don't care about party labels." And that message of anti-establishment really resonated, Ryun said, with voters in Massachusetts who went to the polls for the Republican. Ryun said he believes voting behavior is changing. "I think we're getting to the point where you can truly say we're entering a post-party era. They aren't going to be necessarily wed to a certain party -- they want to see leadership that reflects their values first," he added. "They don't care what party you're in; they just want to know if you reflect their values -- limited government, fixing the economy." As for the upcoming midterm elections? It's a wake-up call, a longtime political analyst said. "The voters in Massachusetts sent a message loud and clear. Maybe even a 'shot heard around the world,' " Ed Rollins, a senior political contributor to CNN and Republican strategist, said in a CNN.com opinion column. "... [It] was a massive win for disenchanted voters everywhere."